A warrant has been issued for her arrest and arrangements made for her surrender. Kunzweiler filed the charge after reviewing dash cam video and helicopter video that captured the shooting. He also reviewed citizen 911 calls, witness interviews and other evidence, according to a news release from the District Attorney’s Office. “Officer Shelby, although now charged, is presumed to be innocent under the law until a judge or jury determines otherwise,” the release states. 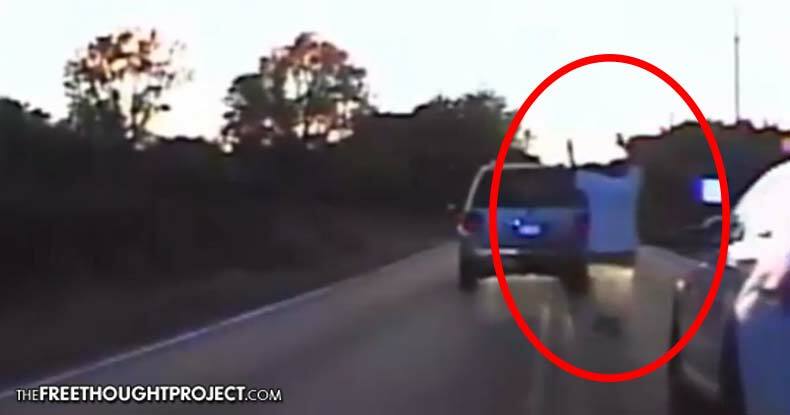 Tulsa, OK — Tulsa Police Officer Betty Shelby fatally shot 40-year-old Terence Crutcher Friday night when he experienced car trouble after leaving night classes at Tulsa Community College — and now, dash cam video of the shooting shows the man’s arms were in the air when Shelby took his life. Police had thus far claimed Crutcher — whose SUV broke down in the middle of the road — approached the officers aggressively while refusing to obey commands to raise his arms, an action the helicopter pilot notes would perhaps be worthy of deploying the Taser. “He’s got his hands up for her now,” the pilot says of Crutcher, adding a moment later the man appears uncooperative and may need to be tased. Officer Tyler Turnbough then deployed his Taser against Crutcher, but Shelby fired before the electric jolt could even knock him to the ground. Video from one patrol car’s dash can and that as seen from a police helicopter circling above clearly shows Crutcher not acting aggressively as the cops surround and then murder him. Worse, he explained, the officers seemed not to treat their victim with any concern, and made no moves to provide first aid after the tasing and shooting. Police on scene indeed appear infinitely more concerned with the panicked Shelby than they do with the man they just shot for no apparent reason, and footage bears out Goss’ statement it takes minutes for officers even to approach the dying man. As Crutcher lies mortally wounded on the ground, officers back away like frightened children, supporting Shelby by the arms. As the helicopter circles overhead, audio of the pilot shows he is quite startled by the inexplicable shooting. Goss explained to the World that Crutcher moved slowly and deliberately throughout his brief interaction with the police. Although authorities had refused to say whether or not a weapon was recovered at the scene, Crutcher’s twin sister, Tiffany insists her brother would not have been armed. Crutcher’s family, their attorneys, local pastors, and several activists were permitted to view the footage before police released it to the public. “We wanted them to see it before it was released so they wouldn’t be blindsided by it,” Tulsa Police Sgt. Shane Tuell confirmed, according to ABC News. “We wanted to be able to have that intimate time with them, with their attorney, to see if they had any questions or concerns. Shelby, on the force since 2011, and Turnbough, an officer since 2009 — who were named by police on Sunday — encountered Crutcher’s stalled SUV as they were responding to another call. Both have been given the paid vacation, otherwise known as administrative leave, customarily ‘rewarded’ after the use of fatal force. “We have to let justice take its course,” Goss said prior to the announcement the Department of Justice would conduct an investigation into the fatal shooting. Activists gathered outside the Tulsa County Courthouse to protest the killing of Crutcher and the ballooning epidemic of police violence, while community leaders urged the public to remain calm upon release of footage. Whether calm and justice will ultimately prevail hinges on whether or not Shelby receives proportionate punishment for taking the life of a wholly and utterly innocent man whose only crime — apparently a capital offense — was having car trouble at an inopportune moment. This is what complying with police in America looks like.